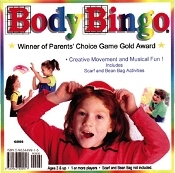 Body Bingo is a creative movement activity CD designed to stimulate the imagination and improve coordination, balance, and agility. Upbeat songs and easy-to-follow narration challenge students to perform body identification, locomotor and non-locomotor movement skills. Manipulative activities with a bean bag and scarf increase eye-hand coordination and proficiency in catching and throwing. There is no right or wrong way to do these creative activities. Play in an open area with space for moving around, catching and throwing. No physical contact required! Be creative, participate and have fun! My kids just couldn't get enough of Body Bingo CD. It si fun, educational and provides for a great excersise routine - a much needed component in life of kid's today when obesity and early childhood diseases are abound. A fun workout for kids - FINALLY!! Thumbs up all the way. This product was a huge help in an event that I did with 30 3yr olds. They loved it. I will absolutly be using it again. Thank you! I recently used this cd with my 1st and 2nd grade students. They had a great time and got a good work out, too! The instructions on the cd are very easy to follow. Kids have to dramatize different animals, toss and catch scarves and bean bags. There is even a freeze dance song at the end that they love, of course!